Two giant rival Chinese state-owned nuclear firms are pulling out the stops to achieve success with exports and increased market share of the restarted domestic reactor construction program. The so-called Hualong One, a 1000 MW PWR type reactor, is being hawked by both firms, but with significant enough design differences that potential customers worry about supply chain issues. China National Nuclear Corp. (CNNC) and China General Nuclear Power Corp (CGN) developed competing designs of a 1000 MW PWR type design mostly differentiated by the configuration of fuel in the reactor pressure vessel. China’s centrally planned economy at the government’s most senior level ordered the two firms to work together. Nominally, both firms agreed to merge their efforts in the Hualong One. China’s State Council gave final approval in April for construction of CNNC’s design for units 5 & 6 of the Fuqing nuclear power station. This is the first project which will use it and completion is expected by 2019. CGN’s version of the Hualong One has been approved for construction of units 3 & 4 at the Fangchenggang site in the Guangxi province. It appears the merger hasn’t taken hold yet. In both cases construction will be first of a kind efforts. However, recent presentations by both firms to potential customers in the UK reveal that differences are barely papered over. In a show of strength the CNNC said at a trade show in Beijing that it’s prior design, the ACP1000, is available to the UK Hinkley Point if Areva, which is supposed to supply two 1600 MW EPRs, suffers further financial setbacks and cannot support its role as the intended vendor. Separately, CGN told project managers for the UK Bradwell site that it has its own version of the Hualong One, the ACPR1000, and as a potential major equity stakeholder, wants to build it as a condition of the investment. While this intense marketing is going on, a third Chinese nuclear firm, the State Nuclear Power Technology Corp (SNPTC) is nearing approval for the construction of two CAP1400 reactors (1400 MW) at Shidaowan in Shandong province. The reactor design is licensed from Westinghouse and based on the 1150 MW AP1000. The larger reactor, which is a GEN III design, is expected to be selected for a number of sites around the country and also offered for export. The marketing and technical advantages of the CAP1400 for export are that it is a scaled up AP1000, a design for which there is quite a bit of information. By comparison, CNNC and CGN, with their competing versions of the Hualong One, may give potential customers some concerns about getting either one built on time and within budget. On this point, however, the four Westinghouse reactors being built in China suffered their own delays due to supply chain problems. There were quality problems with pumps from an American supplier. China has offered its reactors for export to Argentina which set of a competitive response from Russia’s Rosatom which also inked a deal to build one of its VVER’s there. What’s got energy analysts scratching their heads is the question of how Argentina expects to pay for either project. The country is chronically broke and has defaulted on its bonds to international lenders. 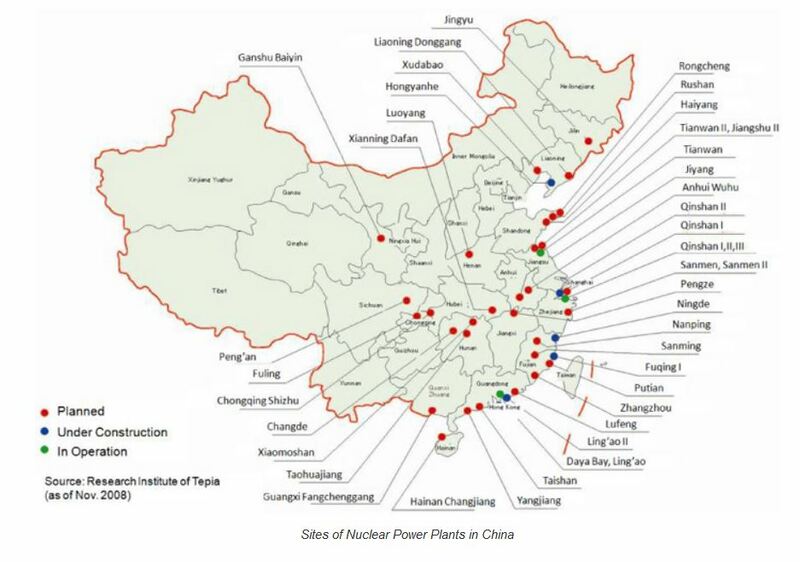 Up to now China has been building its reactors at coastal sites. The reasons include the available seawater for cooling the units and the ability to deliver very large reactor components by barge. However, the China National Energy Administration is now looking at inland sites again. Following the Fukushima earthquake, the agency suspended consideration of new construction starts away from coastal regions. The main issue was consideration of adequate cooling water supplies in an emergency. At issue is a 100% fail safe supply of water in regions which may have some areas which may have inadequate freshwater resources even without the demand of a new power plant. Overall , China expects to build 58 GWe of nuclear power by 2020. It has 23 units under construction for a total of 25 Gwe and 45 units planned for a total of 52 GWe according to the World Nuclear Association profile of China’s efforts.